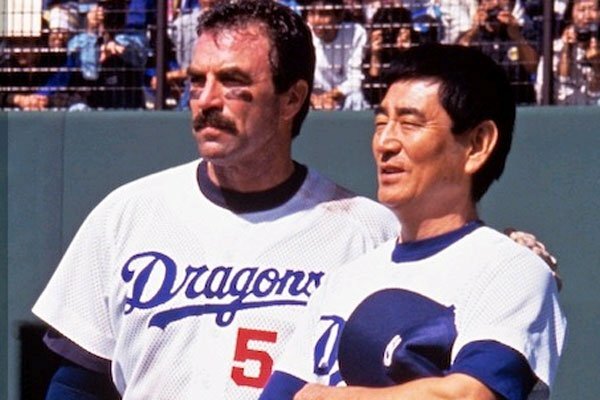 The 2014 Major League Baseball season has begun and to kick it off here’s a look at the best baseball players and coaches at each position from the minds of the screenwriters, directors, and actors in Hollywood. Dorn is a former all-star who simply waits out the end of his contract, hoping to avoid injury so he can go free agent and then Hollywood afterwards. More interested in his stock portfolio than his batting average, when he discovers that he will be unceremoniously dumped at the end of the season along with everyone else on the team, Dorn regains his all-star form and becomes a defensive stalwart at third base, sacrificing his body and future marketing potential to anchor the Indians infield. 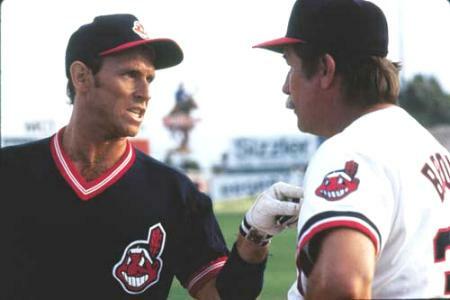 Then in the playoff game against the Yankees, Dorn’s clutch hit starts a rally which allows the Indians to tie the game. Dorn is played by Corbin Bernsen who at the time was a massive TV star thanks to his role on the hit show L.A. Law. 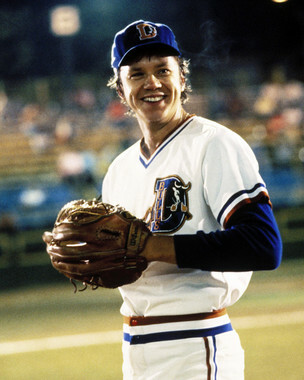 Bernsen would reprise the role of Roger Dorn in both Major League sequels. 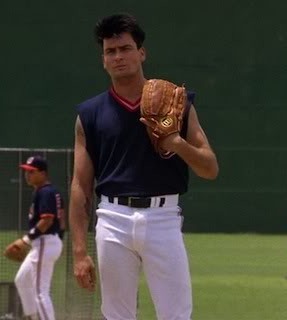 Rick Vaughn is a former car thief with a 102mph fastball and 20/70 vision recruited from the California Penal league. Since being almost blind is a hindrance in baseball; his control suffers, turning his blazing fastball into a lethal weapon and sticking him with the moniker “Wild Thing.” In his major league debut against the Yankees, Vaughn walks the bases loaded on 12 pitches and gives up a grand slam. He then hits the next batter earning him his first ejection. His teammates discover his crappy vision and fit him with a pair of glasses they borrowed from Elvis Costello. Actually being able to see where the ball should go improves Vaughn’s control, he becomes the team’s staff ace and fan favorite. 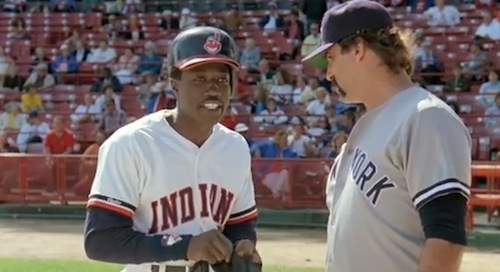 His troubles against the Yankees continue during the season so when the Indians are set to play New York in a one game playoff, Vaughn’s turn in the rotation is skipped and he comes out of the bullpen with enough testosterone and tiger blood to fill Lake Erie, then causes a small earthquake, sending sales of the 60’s hit Wild Thing through the roof. He strikes out the final Yankees batter giving the Indians the chance to win it in the bottom of the 9th, which they do. Winning! The Wild Thing is played by the Wilder Thing, Charlie Sheen. Ebby Calvin LaLoosh was the hotshot pitcher with “a million dollar arm and a ten cent head.” An absolute stud thrower, his problem of course was that he had the maturity of a 2-year-old, a libido the size of Texas, and the attention span of a cocaine addict on meth. LaLoosh takes his signing bonus as buys a Porsche 911 with a quadrophonic Blaupunkt, which he feels is enough to prove he can play in the big leagues. Quickly given the nickname “Nuclear Meltdown” which is shortened to “Nuke”, the organization brings in Crash Davis, the smartest catcher in baseball to mentor him and show him the focus needed to be the superstar he’s destined to become. Nuke however is also getting advice from Annie, a baseball stalker who beds one ballplayer a season with the justification that she is going to turn them into an all-star through the sheer power of her va-jay-jay. Nuke is somehow able to straddle the line between the advice he gets from Davis (mainly stop sleeping with Annie and learn to throw a curveball), and the advice he gets from Annie (wear my underwear while you pitch) to become the pitcher he is supposed to be and gets the call up to majors. Nuke LaLoosh is played by Tim Robbins who is currently on TV right now as it is law that The Shawshank Redemption must be played 24 hours a day over various channels lest we forget how awesome it is. Larry Hockett is the gum chomping pitching coach of the then Single A Durham Bulls given the organization’s prized possession – Ebby Calvin LaLoosh, who is destined to be an all-star he quickly realizes he is in over his head, so when his manager brings in veteran catcher Crash Davis to help teach the kid how to pitch, Larry doesn’t get his nose out of joint instead he welcomes the help. Hockett is actually a decent coach and the perfect wingman for his manager, helping him address the team of lollygaggers and listening to his star pitcher when he becomes unable to breathe out of his eyelids properly. Hockett’s shining moment comes when he interrupts an extremely long meeting on the mound and solves the big “what do we get Millie and Jimmy for their wedding present” dilemma. Hockett is played by Robert Wuhl who the next year appeared in a minor role in Tim Burton’s Batman where he didn’t solve anyone’s wedding issues. 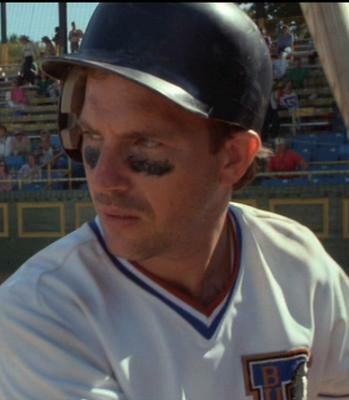 Jimmy Dugan is a former power hitting World Series hero who after blowing out his knee, crawls into a bottle to lament the early exit of his baseball career. 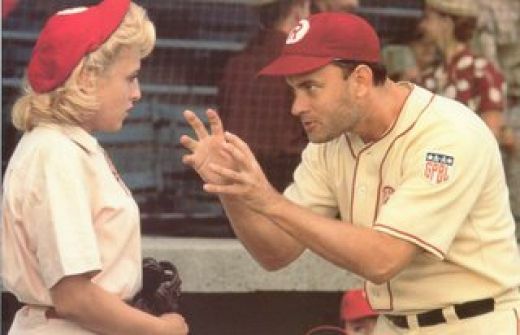 After a series of managing failures he is given the job of managing the Rockford Peaches, one of the first women’s professional baseball teams because he still has name recognition. He approaches the job by deciding to soak up all of the misogyny in the greater Chicago area and then drenching it in bourbon chaser. 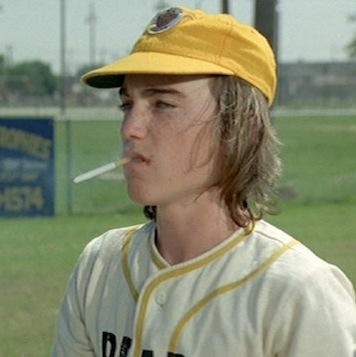 Hung-over and giving zero f*cks, Dugan doesn’t even fill out a lineup card or bother to learn the player’s names. He spends the first part of the season completely bombed until in a rare moment of sobriety, he notices the team star player (who has been acting as de facto manager) signal for a squeeze bunt instead of letting their best hitter swing away. 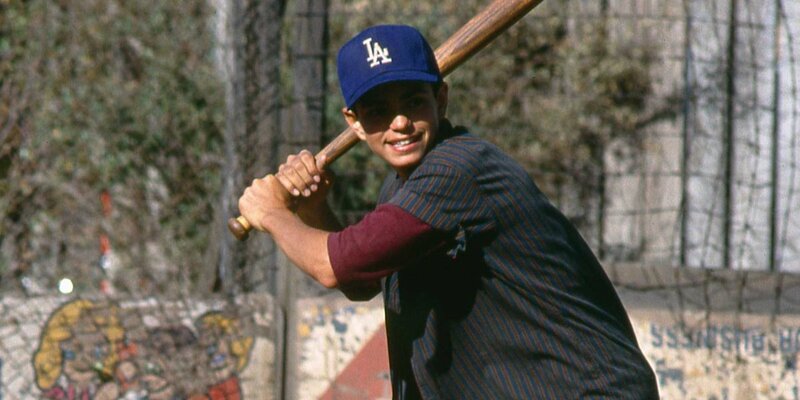 Realizing that the women around him can actually play baseball, Dugan starts to lead them and in doing so rediscovers the passion for the game that lay dormant inside him. Jimmy Dugan is portrayed by Tom Hanks who the very next year would win his first Academy Award. Would you like to see a topic discussed on L.A.P? Follow this link HERE. Jackson Holden Solo DeVoss learned how to write poems from an old blind man he met while incarcerated in a Madagascan prison for crime he did not commit. After serving three long hard years, Solo was finally paroled when a wealthly lady friend paid the ransom for his release. Solo then traveled to a Shaolin monastery located high in the mountains of Myanmar; where he learned the mastery of many mystical and ancient arts from the Head Abbot, a crippled monk named Brother Lars who quoted Oscar Wilde too often. Two years later, Brother Lars and most of the other monks were killed - during an attack that was carried out under the cover of a horrendous snowstorm by ninja assassins of the Dark Hand Cult. Solo and a few others escaped, but the monastery was burnt to the ground. After slumming around Southeast Asia for five years, Solo migrated back to his home in the United States - where he became a vigilante crimefighter, fighting against the nefarious schemes of the Dark Hand Cult and its ninja assassins. He also published his first book, 'Names For Boys And Girls' and a collection of poems entitled 'Columbus Lost Another Genius'. Solo now lives in an abandoned church in Columbus, Ohio where he writes freelance, fights crime, and has a major drinking problem. Awesome lineup. 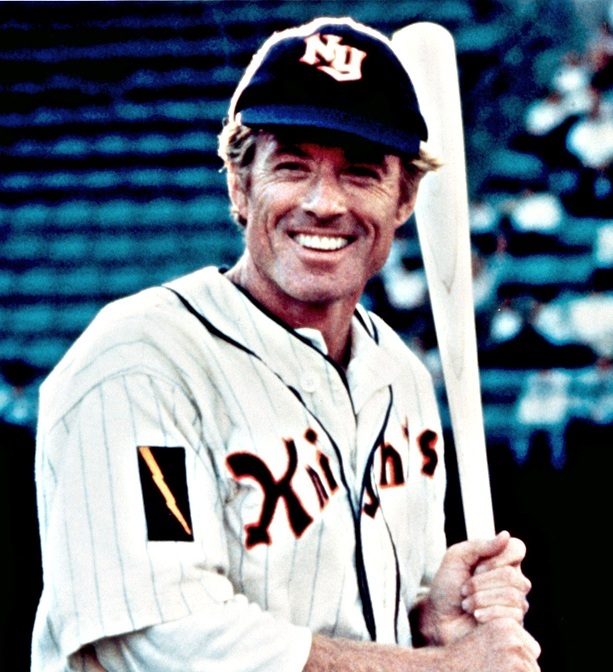 Major League was the best baseball movie evah. 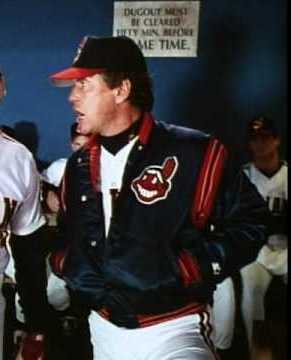 I love Major League. Now, where can I find a chicken to sacrifice to remove this curse on my bat? You’re crying? 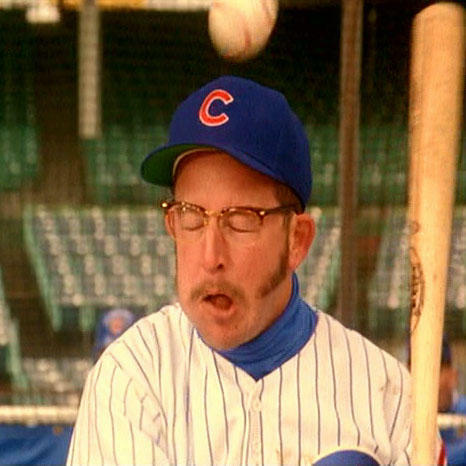 There’s no crying in baseball! was never a fan of major league. 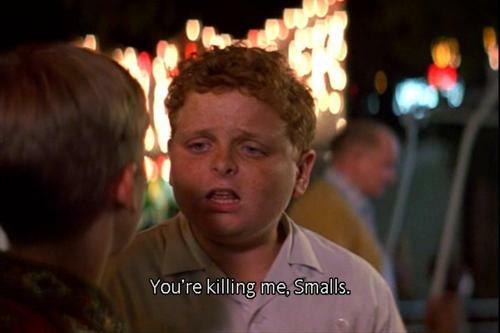 loved the sandlot and greatly identified with it both because of the time period and sentiment. 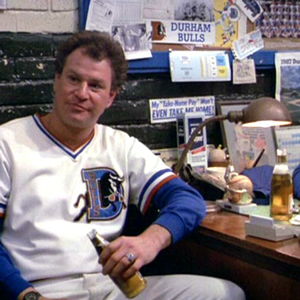 i think my favorite moment from any baseball movie is the conference on the mound in bull durham. What about Bump Bailey in The Natural? Talk about a guy who gave it his all. Love The Natural and I’m with you on all its shortcomings in spite of that. I’d add that Redford’s swing is awful. So this is kinda like, fantasy (squared) baseball… hmm. Great lineup! Reblogged this on Christopher De Voss. Madonna didn’t make the list? I like that picture of Kit Keller. Wow, look at her form, not to mention her balance. This is quite the dream team. “Dream Team” seems to be the general consensus. I’m just impressed I not only knew everyone of these movies but I also watched them and knew the characters. Yet, I don’t do baseball. Not a big fan of baseball…but I’m disappointed there is no Brad Pitt from Moneyball…he gave a stellar performance and ate a lot of food. Don’t forget characters from the movie Long Gone.